A practical case carried out in the conservation studio of the Thyssen-Bornemisza Museum, on a painting of 19th Century artist, François-Auguste Biard, where we faced the elimination of the lining it underwent, probably sometime at the beginning of the 20th Century, and which had caused very accute deformations on the original support. Following the department’s intervention protocol, we will see the different phases that make up a restoration treatment. 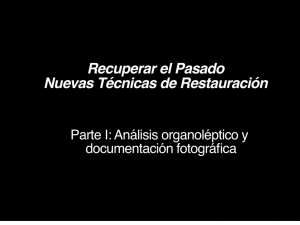 Conservation exam, the taking of photographic documentation, sample analysis and laboratory evaluation, the planning of an intervention strategy, the restoration treatment, etc. In this particular case, we set up an alternative cleaning method of the reverse using Agar gel, and a cleaning method for the obverse with resin soap and paper barrier.